Shanghai Disneyland is expanding with a seventh themed land next year when Disney Toy Story Land opens. This new land will be the first expansion at the theme park since it opened in 2016. Just like in Toy Story Land at Disney’s Hollywood Studios, guests at Disney Toy Story Land in Shanghai Disneyland will be shrunk down to toy size. The new land will feature Slinky Dog Spin, Rex’s Racer – a u-shaped track ride, and Woody’s Round-up which will feature “a herd of ponies rounded up by Sheriff Woody himself will swing you around in their carts for a lively square dance inside a ranch set up by Andy,” according to the description from Disney. In the nearby Old West, guests can meet characters from the Toy Story films and have photos taken. 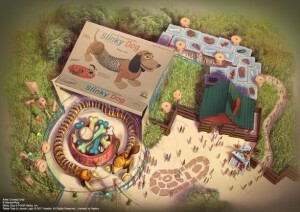 The area will also feature the Toy Box Cafe and Al’s Toy Barn. Shanghai Disney Resort is also home to the only Toy Story-themed hotel at the Disney Parks. Disney Toy Story Land is set to open April 26, 2018.